MLB and the Players Association decided on a domestic abuse policy last August. Why has it been so difficult to come up with a ruling? From left: Aroldis Chapman, Yasiel Puig, and Jose Reyes. Rockies shortstop Jose Reyes, Dodgers outfielder Yasiel Puig, and Yankees closer Aroldis Chapman have been investigated for weeks by Major League Baseball for their alleged roles in domestic violence incidents. Commissioner Rob Manfred, speaking to the media Friday, said he will likely rule on two of the three cases in the next few days. “My strong preference would have been that this would have been decided by this point in the calendar,” Manfred said. “More important than the calendar is making sure that we know all the facts before I make a decision. The worst thing that can happen from our perspective is to make a decision and find out that we decided without knowing everything that happened. MLB and the Players Association decided on a domestic abuse policy last August. Why has it been so difficult to come up with a ruling? Chapman’s case could be the most interesting because police in Davie, Fla., filed no charges against the reliever, even though the accusations were, according to a police report, that he choked his girlfriend and also fired up to eight shots into the wall of his garage after arguing with his girlfriend. Charges were never brought because of conflicting stories. With no criminal charges, the Yankees chose to obtain him from the Reds at a bargain cost. Yankees general manager Brian Cashman certainly took a big chance in trading for Chapman, but the talent was too hard to ignore, giving New York an airtight back end to the bullpen with Chapman, Dellin Betances, and Andrew Miller. The Yankees were willing to live with some suspension time to reap the long-term benefits, but there’s significant PR backlash in trading for an alleged domestic abuser. The Dodgers backed off Chapman after agreeing to a deal with the Reds, feeling they did not want to get involved with a player with that history. The Yankees decided that a good deal is a good deal, hopeful of the fact that Chapman’s punishment may not be that severe because of the lack of criminal charges. They may be right. 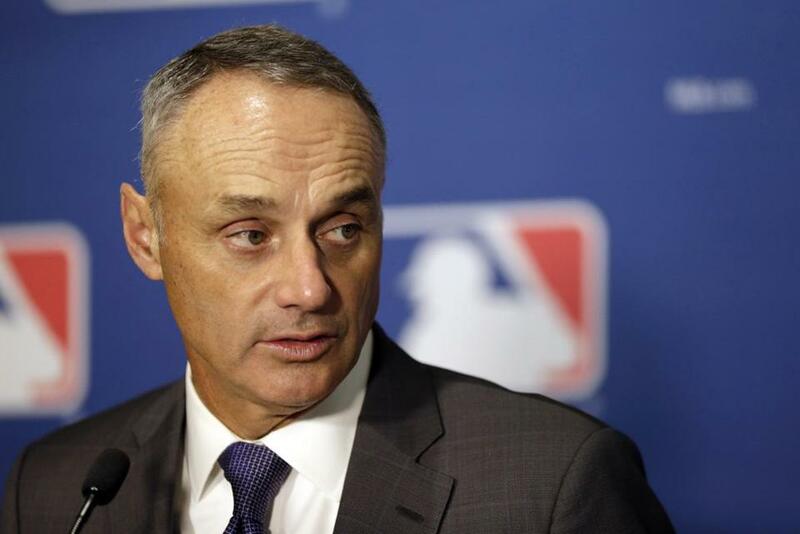 Rob Manfred is expected to rule on two of three domestic violence cases soon. It would appear, however, that the commissioner would have to dole out some type of punishment, which Chapman said he would appeal. Manfred needs to show a strong hand when it comes to domestic abuse, but the more severe punishment may be dealt to Reyes rather than Puig or Chapman. Manfred won’t rule on Reyes until his trial, which begins on April 4, is adjudicated. Reyes was accused of beating up his wife while on vacation in Hawaii in October. Reyes has pleaded not guilty. According to a 911 tape, his wife suffered neck scratches and an injury to her left leg. Police reports said Reyes grabbed his wife by the throat and shoved her into a sliding glass door. After being treated at the scene, she was transported to Maui Memorial Medical Center, according to the police report. Puig was involved in a bar fight in Miami in November. Reports said he had shoved his sister and that he got into a fight with the bar’s bouncer. Neither Puig nor the bouncer pressed charges against one another, and Puig was also not charged with the alleged shoving of his sister. So the three incidents are very different. Reyes’s situation seems the worst of the three. He is owed $22 million a year for the next two years. He has not reported to Rockies camp. This is MLB’s first foray into this sensitive matter. It has likely learned from the terrible mistakes made by the NFL. 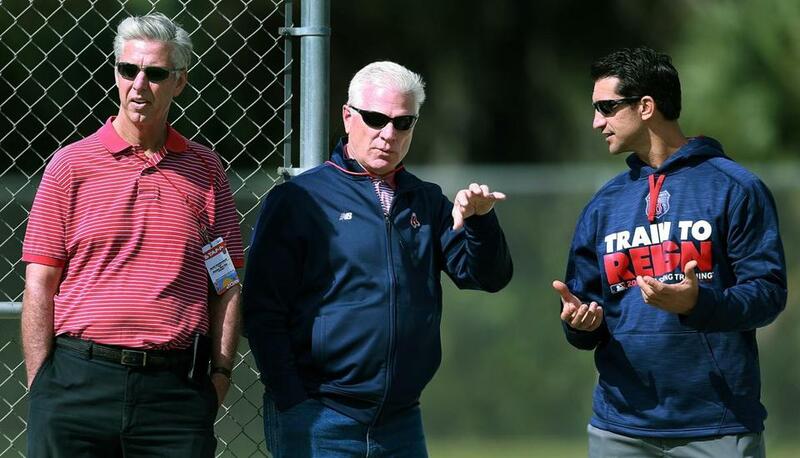 From left: Red Sox executives Dave Dombrowski, Frank Wren and Mike Hazen hung out together while watching pitchers threw in the bullpen Friday. During his media session, Rob Manfred also gave his take on why so many free agents remain unsigned. “First of all, it was a big free agent class this year,” the commissioner said. “One of the things that the MLBPA has always wanted is a market-based system. It’s been a long time since I took Economics 101, but my recollection is that when you have a lot of supply in relation to relatively fixed demand, the market’s going to operate differently than one might expect. So it’s not a surprise to me, given the size of the class. Red Sox president of baseball operations Dave Dombrowski and Twins general manager Terry Ryan also addressed the situation. “We’re just keeping abreast of the guys that are out there at this time,” Dombrowski said. “We’re not offering major league contracts to anyone. But we’re keeping abreast of what’s taking place, and if somebody ends up agreeing that we have a pulse on, we would bring that person in. I can’t tell you if we’re close or not because really it’s more dependent upon their situation. More like the Carlos Marmol situation, maybe more guys that have played in recent times. But we’ve expressed interest and they have some interest but I’m not sure if we’ll do anything or not. It’s more dependent on them. Ryan said he, too, is monitoring the market. Hanley Ramirez had been using Mike Napoli’s first baseman mitt. 1. 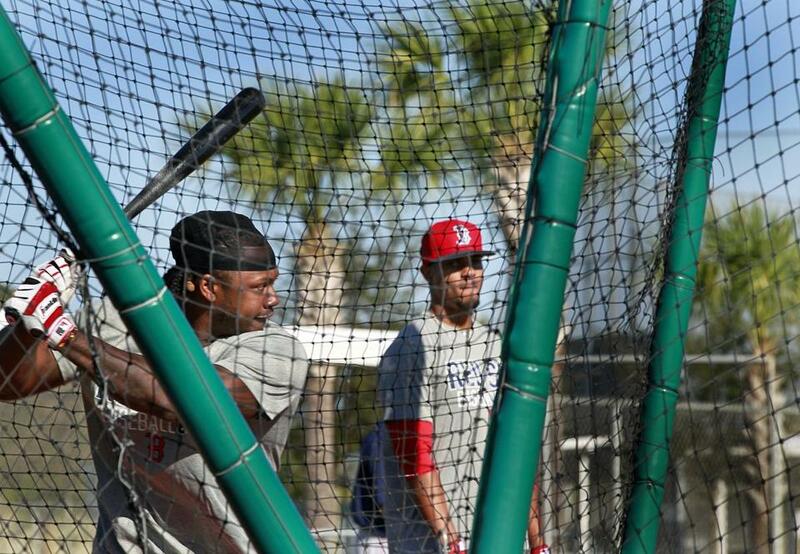 Hanley Ramirez began working out at first base in Fort Myers using Mike Napoli’s old mitt, which had been left in the Red Sox clubhouse. Ramirez’s first baseman’s mitt had been sent to his Miami home after he left for spring training, but he’s using his own glove now. 2. You can see why Christian Vazquez hates that he might have to start the season in Pawtucket. He thinks he can play full time in the majors right now. 3. One of Dave Roberts’s bigger challenges as Dodgers manager is turning Yasiel Puig, 25, into a responsible, All-Star-caliber player and true team player. If he can do that, then the ever-optimistic Roberts will go down as a success. 4. Don’t be shocked if the Dodgers part ways with Carl Crawford and eat the remaining $42 million on his contract. There comes a point of diminishing returns — and a time to fill his roster spot with a younger, more productive player — and it seems the Dodgers are getting closer to that point. 5. If Dan Duquette picks off free agents Yovani Gallardo and Dexter Fowler, he’ll have completed some pretty decent late-bargain shopping. The Orioles will be in the hunt if they complete those moves. 6. I sense that whichever team gets Justin Morneau as a late-camp signing is going to be happy it did. 7. The dialogue between special instructors Luis Tiant and Jim Rice at Red Sox camp is quite humorous. The former teammates and dear friends get on one another unmercifully. NESN captured some of this (albeit a toned-down version) on camera last week. 8. Dwight Evans spent some time with Red Sox outfield coach Ruben Amaro explaining how he played the position so well for so many years. Evans, an eight-time Gold Glove winner, knew how to take the right angle and be in the right position to throw. 9. It’s interesting that last season the Cubs had the most days spent on the 15-day disabled list (674), while the Red Sox had the most days spent on the seven-day concussion DL (23). 10. The Rangers are quickly becoming my sleeper team. With Yu Darvish and Derek Holland back for full seasons, and returning a strong lineup, Texas could be very good. 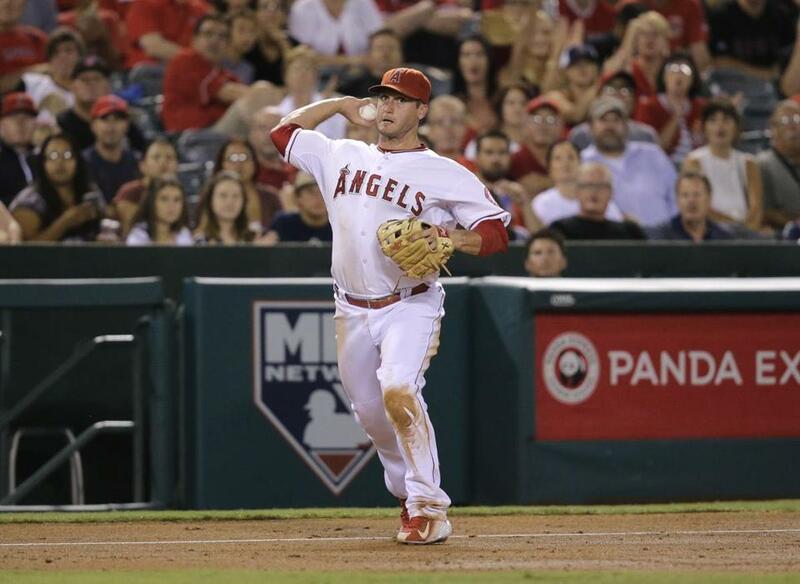 David Freese batted .257 last season. 1. David Freese, 3B, free agent — Freese’s stock has certainly diminished over the years after his fast and furious start with the Cardinals. But to remain on the market? “He’s a useful player,” said one American League scout. “You can argue if he’s a full-time starter. Maybe he’s someone you platoon, but with his experience and the potential for some righthanded power, I’m surprised nobody’s taken the leap yet.” The Indians considered him before they signed Juan Uribe. 3. Carlos Marmol, RHP, Red Sox — The Red Sox aren’t expecting miracles from the former Cubs closer, but there’s the possibility Marmol could recapture some of his old form and be strong inventory at Triple A. Whether Marmol would elect to stay with the Sox under those circumstances is another issue. But Dave Dombrowski, knowing the fragility of bullpens from his Detroit experience, is trying to build depth, and don’t be surprised to see one or two other relievers come to camp. 5. Austin Jackson, OF, free agent — Jackson never achieved what so many scouts had hoped for him, but he remains a serviceable backup, a righthanded bat with some pop who can play the outfield. Jackson was never a good on-base man, which has diminished his value. But he is getting a few bites and could land with the Rangers or Cubs. 6. Tony Clark, players’ union executive director — It’ll be interesting to see how smoothly the collective bargaining session will go in Clark’s first time as the head man, following the death of Michael Weiner. Clark has been in the negotiations before, but there are a lot of issues that may take time to resolve. The sides have agreed to begin talks before the season and hope to reach an agreement by the fall, well ahead of the Dec. 1 expiration of the current CBA. 7. Nick Punto, INF, retired — The former Red Sox middle infielder called it a career last week. Punto was part of the massive deal in which Boston sent Josh Beckett, Carl Crawford, and Adrian Gonzalez to the Dodgers. Punto was a very good utility player. He wanted to spend more time with his kids rather than try to make a team out of camp. 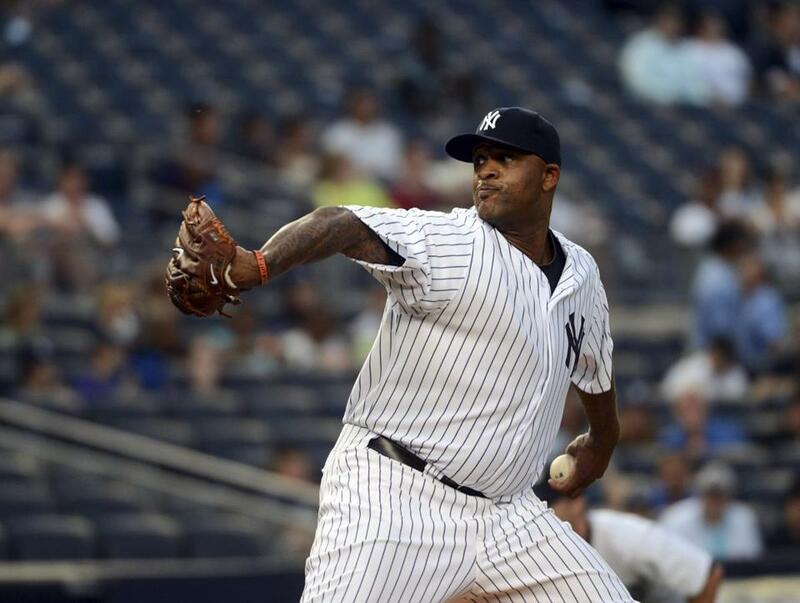 CC Sabathia could be a comeback candidate. 8. CC Sabathia, LHP, Yankees — The Yankees brass really doesn’t expect much out of Sabathia other than competing for the No. 5 starter job, but Sabathia is talking like a renewed man early in camp after undergoing alcohol rehabilitation and spending the offseason resting his balky knees. If Sabathia can keep his fastball around 88-90 miles per hour, the feeling is he could be quite the comeback candidate. 9. Joe McIlvaine, senior adviser, Orioles — With the recent hiring of McIlvaine, the Orioles have quite the veteran brain trust in Lee Thomas, Jeremy Kapstein, and McIlvaine to assist Dan Duquette, who has shown that he really values veteran advisers who have seen it all. Duquette also has a brilliant talent evaluator in Brady Anderson. From the Bill Chuck files — “In Mike Napoli’s last 994 plate appearances, he has struck out 259 times; in Victor Martinez’s last 2,927 plate appearances, he has also struck out 259 times.” . . . Also, “After starting an at-bat 0 and 2, in 160 plate appearances, Starling Marte hit .283, the highest post-0-2 rate in the majors.” . . . Happy birthday, Jack Billingham (73). 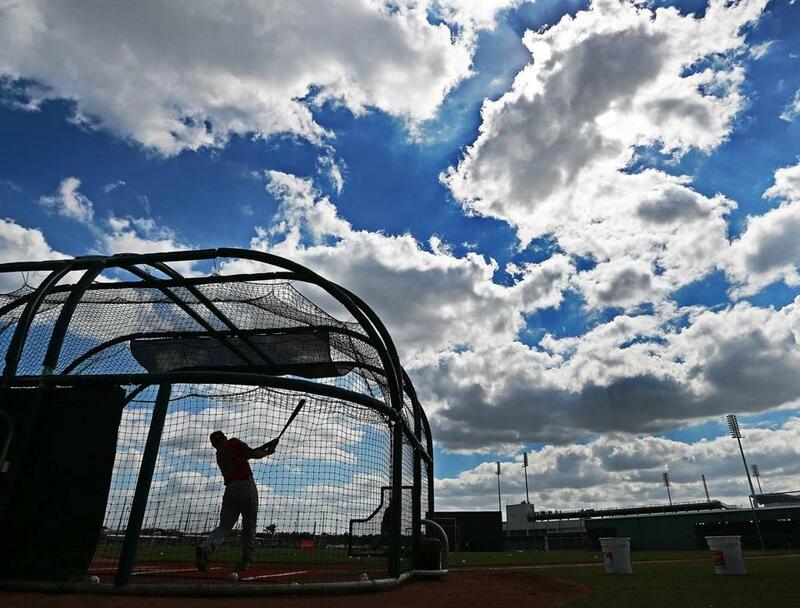 Blake Swihart took some cuts during batting practice Friday in Fort Myers, Fla.
Full squads will start reporting to camps in Florida and Arizona this week as spring training kicks into high gear. A new wrinkle: Many teams will be sporting revised spring training caps and jerseys. A look at spring training sites, when the games begin, and some of the new gear that will be on display.